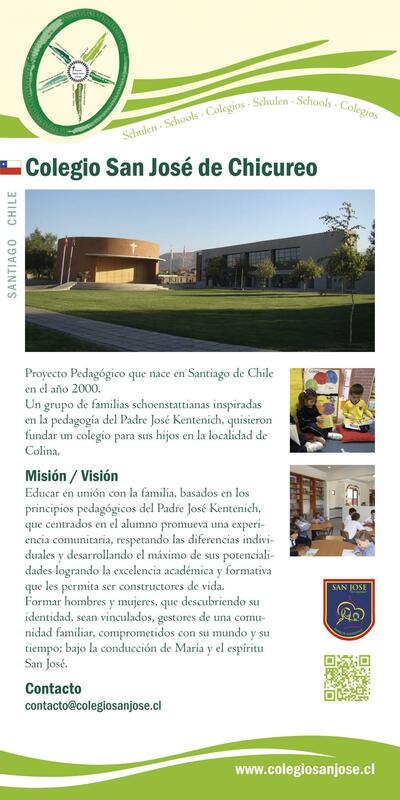 The school of St Joseph of Chicureo has existed in Santiago, Chile since 2000. Inspired by Fr Kentenich‘s pedagogy a group of Schoenstatt Families wanted to collaborate with the Schoenstatt Fathers to found a school in Colina, Santiago de Chile. Pedagogical emphases: Academic education in collaboration with the family. To promote a community experience and at the same time consider individual differences. Develop the potential of the students and aim at academic excellence. To enable the individual student to become builders of life. To form men und women who discover their identity, are able to form family-like communities, and take on responsibility for society.